Two years earlier than projected, Wake Will: The Campaign for Wake Forest has reached the half-billion dollar mark in total campaign commitments and is more than 83 percent toward its Reynolda Campus goal. As of June 30, 2015, Wake Forest has raised more than $503 million of its $600 million goal for the Reynolda Campus. The University received over $100 million in gifts and commitments between July 1, 2014 and June 30, 2015, signaling the institution’s largest-ever fundraising year. Scholarships and financial aid – Wake Will has raised more than $154 million in scholarships and financial aid, with a particular focus on increasing access for first-generation and middle class students, as well as completing an important initiative for international scholarships. Assisting the Innovation, Creativity and Entrepreneurship program, designed to create and sustain an educational environment that inspires and equips Wake Forest students to become innovative thinkers, value creators and entrepreneurial leaders. Facility improvements– This year, Wake Will has made possible a number of new capital projects. Renovations are underway for the Law Commons in Worrell Professional Center, and an additional wing is being built for Health and Exercise Science. Several classrooms around campus are scheduled for enhancement and renewal this summer as well. The Z. Smith Reynolds Library is undergoing improvements and the expansion and renovation of Reynolds Gym into a dynamic hub for wellbeing continues. Fundraising for the McCreary Field House is complete, and construction is nearing the halfway point. The Haddock House, home of Wake Forest men’s and women’s golf, and the soccer field renovation also are underway. Indeed, every dollar from every donor counts. Seventy-eight percent of donors to the campaign have committed less than $1,000 (up from 74 percent this time last year). Fifty-four percent of donors have given less than $250 (up from 47 percent). Harsh Patolia, a senior biophysics major, is one of the young people who has benefitted from the generosity of Wake Will donors. 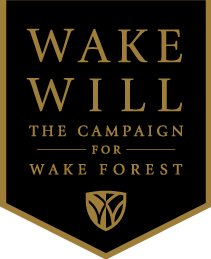 Additional information about the campaign is available at wakewill.wfu.edu.